This week marks the start of the biggest democratic election in human history, at least if we mean by democracy a vote for a parliament. Around 814m Indians are eligible to vote over the next six weeks to elect a parliament from which a government will be formed in late May. The incumbent Congress party-led coalition is heading for a big defeat. The Congress party, India’s main bourgeois party that has ruled for most of the years since independence from British imperial rule in 1949, has been controlled by a family dynasty based on its leader Nehru and the Gandhis. Rahul Gandhi and his mother Sonia currently control the party. But the failure of their government to sustain economic growth and make sufficient jobs available for the impoverished agricultural peasants and the unemployed and underemployed of the teeming cities has lost them support. As the mainstay of the Indian capitalist class, the Congress leaders have been caught in a series of scandals and corruption that has turned the people away. Congress will be lucky to return half the 200 or so seats they won last time in 2009. Voter opinion at a national level has turned towards the Bharatiya Janata Party (BJP), led by Narendra Modi. The BJP has ruled before from 1998 to 2004. But the BJP proved to be an unreliable tool for Indian capital, riddled as it is with former members of what is basically a Hindu religious fascist party, the Rashtriya Swayamsevak Sangh (RSS), an organisation modelled on Mussolini’s Black Brigades. Modi is a long time member and worker of the RSS who has moved seamlessly into the BJP. He claims, of course, that he has moved on and will now be doing the bidding of capital as a whole and will no longer push his former Hindu communalism. But Modi has been chief minister in Gujarat state since 2001, where pogroms of Muslims have taken place without a blink from the Modi government. But that does not matter to India’s capitalist class, as long as it does not get out of hand. For them, Modi is now seen as leading a ‘business-friendly’ government as he proved in Gujarat, where multi-national companies were welcomed with cheap land deals, reduced taxes and deregulated environmental laws. This is what he likes to call Modinomics. The irony is that while Modi has made much of his success in boosting growth in Gujarat with neo-liberal policies, the reality is that Gujarat has done little better than other states led by Congress or by more radical ‘social-democrat’ governments. Amartya Sen, the Nobel laureate economist, has said the Gujarat state’s social and economic progress is poor. Others claim that keeping growth at healthy levels in Gujarat, a mid-sized state with a strong tradition of trade and a better infrastructure than much of the country, is easier than elsewhere. Gujarat’s growth rate in the 1990s was 4.8%, compared to the national average of 3.7%; in the 2000s it was 6.9% compared to the national average of 5.6%. The difference between Gujarat’s growth rate and the national average increased marginally, from 1.1 percentage points to 1.3 percentage points. Maharashtra, the top-ranked state in terms of per capita income in the 2000s, improved its growth rate from 4.5% in the 1990s to 6.7% in the 2000s. The difference between Maharashtra’s growth rate and the national average grew from 0.8 percentage points to 1.1 percentage points. 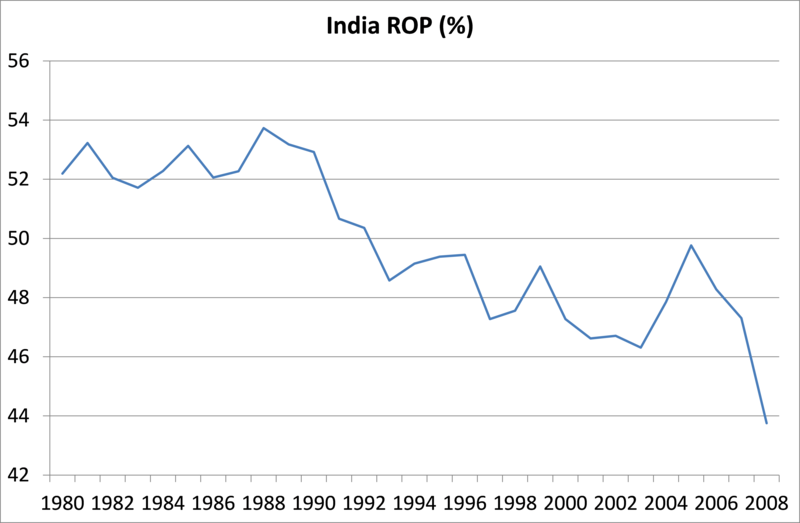 Contrast this with the performance of Bihar, the state that has been in the bottom of the rankings in terms of per capita income throughout: its growth rate was 2.7 percentage points below the national average in the 1990s, but 1.3 percentage points higher in the 2000s. So Modi’s performance is nothing special. And the problems for Indian capitalism are mounting. 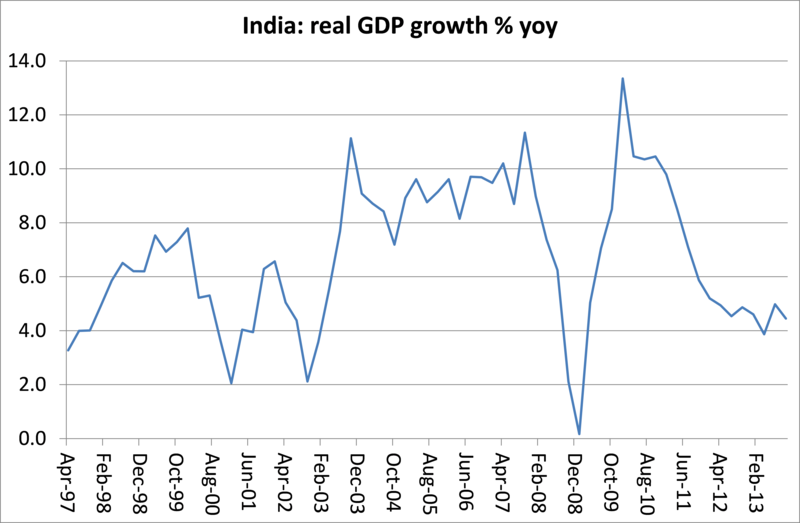 After achieving spectacular growth averaging above 9% over the past decade, India has started to slow in the last few years. The slump in infrastructure and corporate investment has been the single biggest contributor to India’s recent growth slowdown. 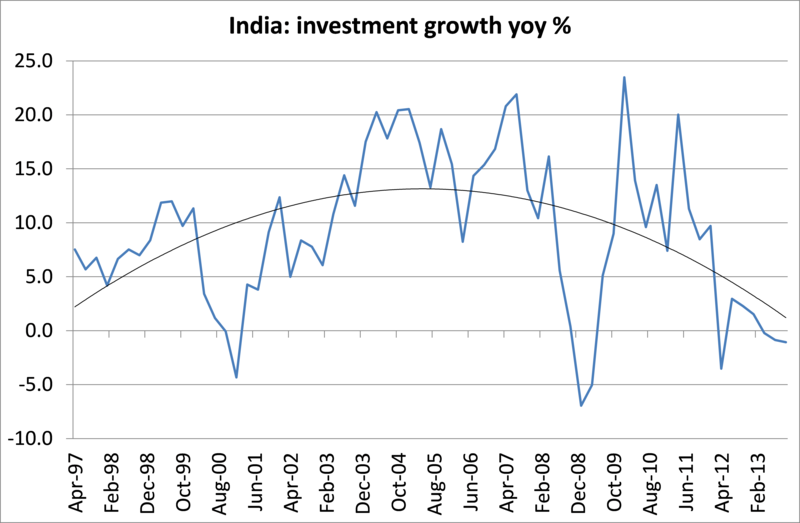 India’s investment growth, averaging above 12% during the last decade, fell towards zero in the last two years. Mainstream Indian economists blame high interest rates and ‘too rigid’ labour rights. The IMF in turn blames “heightened uncertainty regarding the future course of broader economic policies and deteriorating business confidence”. The IMF wants the new Indian government to raise energy prices to make the state-owned companies profitable and stop labour unions trying to preserve wages and employment, so that the young unemployed can get work (at lower wages, of course). Two-thirds of Indian workers are employed in small businesses with less than ten workers, where labour rights are ignored – indeed most are paid on a casual basis and in cash rupees, the so-called ‘informal’ sector that avoids taxes and regulations. India has the largest ‘informal’ sector among the main so-called emerging economies. But small businesses are not very productive. Indeed, India has the lowest productivity levels in Asia. Productivity would rise if generally underemployed peasants could move to the cities and get manufacturing jobs in the cities. This is how China has transformed its workforce, of course to be exploited more by capital, but also to raise productivity and wages. China has done this through state planning of labour migration and huge infrastructure building. India cannot, so its rate of urbanisation is way behind that of China. So Indian and foreign capital are still not fully exploiting the huge reserves of mainly youthful labour for profit. As a result, employment growth is pathetically slow. An estimated 10-12m young Indian people are entering the workforce each year but many cannot find jobs due to their paucity or because they lack the right skills. Congress says it will find jobs for low caste rural people by introducing ‘affirmative action’ in companies. This would do little except enrage large and small capitalists alike. At the same time, it goes along with the IMF for “a more flexible labour policy”. And there is the issue of basic resources for India’s 1.2 billion people. Mechanically pumped groundwater now provides 85% of India’s drinking water and is the main water source for all uses. North India’s groundwater is declining at one of the fastest rates in the world and many areas may have already passed “peak water”. The World Bank predicted earlier this year that a majority of India’s underground water resources will reach a critical state within 20 years. The big demand from Indian capital is to cut back the size of the state. Bureaucratic and inefficient as it is, India’s central and state government, as well as state enterprises set up in the early days of ‘socialist’ India, have provided some solidity to India’s economy. But the multi-nationals and large Indian capitalists want this to go. Central and state government run up significant annual budget deficits because they subsidise food and fuel for the millions of poorer Indians. Those deficits are funded by borrowing and the cost of that borrowing has steadily eaten into the available revenue from taxes, leaving little for education, health or transport. Government tax revenues are low because Indian companies pay little tax and rich individuals even less. 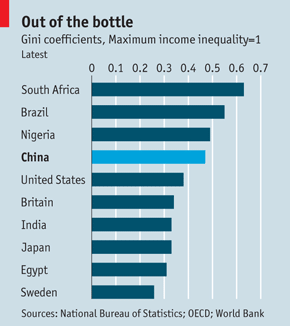 Inequality of income in India is not as high as in China, Brazil or South Africa, but it is probably higher than the official gini index because of huge hidden income among the rich and it has been rising. According to the OECD, income inequality has doubled in India since the early 1990s. The richest 10% of Indians earn more than 12 times as much money as the poorest 10%, compared to roughly six times in 1990. The answer for Indian capital and endorsed by Modi is privatisation, cuts in food and fuel subsidies and a new sales tax, a tax that is the most regressive way to get revenue as it hits the poor the most. The aim here, as it always is with neoliberal economic policy, is to raise the rate of exploitation of labour so that the profitability of capital is boosted and thus provide an incentive to invest, something Indian capital is refusing to do right now. Indian companies are increasingly heavily in debt: corporate debt to GDP is one of the highest in Asia. And the cost of servicing that debt has risen sharply as the Reserve Bank of India has been hiking interest rates to try and control the highest inflation in Asia. Indian capital’s profitability had been falling steadily (if from a high ‘emerging market’ level) even before the global economic slump started. It has fallen further since and is now some 20% below levels in the 1980s. The boom double-digit growth years of the early 2000s, when all the talk was about India’s software outsourcing industry and new auto companies, seem unlikely to return without drastic reductions in the share of value going to labour. A victory for Modi is likely and that is making India’s business class beam. The Indian stock market has reached new highs. But India’s electorate is faced with a choice at a national level between a corrupt family-run party backed by big business and landholder interests and an extreme nationalist party that has adopted Modinomics to ‘solve’ Indian capitalism’s failure to deliver sufficient growth and better profitability. It is a choice that will make many vote instead for various regional parties or small radical parties which may well hold the balance of power in parliament, as before.